And so 2016 draws to its close, a year which for many people around the world has been so crowded with shock one suspects its departure will not be much mourned. But like Barthelemy Cramillion’s mid-18th century stucco bird (originally in Mespil House, now in Dublin Castle, for more see Head in the Clouds, March 2016) we must try to soar above our present circumstances and hope the future will bring better times. And like the elephant below in the entrance hall of Huntington Castle, County Carlow, we can do our best to move forward slowly and steadily. To paraphrase Samuel Beckett: Well, shall we go on? Yes, let’s go on. The Irish Aesthete wishes a very Happy New Year to all friends and followers. Above are three images of the main staircase in the former Archbishop’s Palace, Cashel, County Tipperary. Long attributed to Sir Edward Lovett Pearce and dating from c.1730 this building is rightly deemed important for retaining much of its original interior, not least these stairs in red pine. Its features include a richly carved apron below the first-floor gallery and the balusters, those on the return capped with Corinthian columns, the others being fluted in their upper section and with barley-sugar twists in the lower. As the picture above shows, until the late 1860s Bessmount, County Monaghan was a fairly standard, medium-sized country house, of two storeys over basement and with a five-bay façade onto which the box-like porch had been added. With a Wyatt window on the first floor being the only feature of interest, it looks to be of indeterminate date, both 1722 and 1807 having been proposed as when originally constructed. Either or indeed any time in between are possible, since the building gives the appearance of being solid but unimaginative in its design. In the 18th century the land on which it stands belonged to a branch of the Montgomery family and in 1758 an eldest daughter, Mary Montgomery married Alexander Nixon of the now-demolished Nixon Hall, County Fermanagh. The couple’s second son, Alexander Nixon Montgomery, inherited Bessmount where he lived until his death in 1837. Although Alexander Nixon Montgomery and his wife Eliza (nee Stanley) had no less than nine children, Bessmount was sold a few years after his death. The purchaser was John Hatchell, a wealthy Monaghan brewer who a few years later married Elizabeth Anne Speer from nearby Glaslough. Their daughter Frances Maria in turn married William Henderson whose own family were associated with the linen industry and it would seem that the couple, having sufficient funds from their forebears’ respective businesses, decided to recast Bessmount, transforming what had been a rather staid residence into something completely different. Despite its extraordinary appearance, and relatively late date, we do not know who was the architect responsible for Bessmount’s makeover. Two names have been suggested, one being the Newry-born William Barre who worked mostly in the Ulster region and whose Danesfort House in Belfast has a very similar entrance tower. But Barre died in 1867 (that is, before work began at Bessmount) so the other architect proposed is John McCurdy, then working nearby on Monaghan’s District Lunatic Asylum (now St Davnet’s Hospital), the largest such institution in the country. Whether one of these gentlemen or another party, whoever received the commission clearly had a field day with the project, no doubt encouraged by his clients whose carved portraits can be seen in medallions on either side of the entrance porch (Mrs Henderson being tricked out to look like Queen Elizabeth I: perhaps a play on the house’s name?). Bessmount metamorphosed from a dull Georgian block into an extravagance of Ruskinian Gothic, thanks to the use of certain devices such as bands of yellow and red brick especially in the aforementioned tower (which originally served the practical purpose of holding the house’s water tanks). Asymmetry rules across the intentionally stepped façade, so that the eye is constantly moving from one feature to the next, whether the large gable featuring crests of the Hatchell and Henderson families, the trefoil-headed canted bay window that lights the drawing room or the first-floor oriel turret on the opposite side of the house. Meanwhile the south-facing garden front is enlivened by a Gothic conservatory raised on arcades, while to the immediate north a short link leads to the only major extension to the property, a large ‘music room’ that both inside and out resembles a Victorian village hall. The interiors of Bessmount are not as remarkable as the exterior, perhaps because funds – and imagination – ran low. To a considerable extent they retain their pre-refurbishment appearance, albeit here and there tricked out in gothic finery. The majority of chimney pieces, for example, were in the original house, but their interiors now lined with pretty Minton tiles. Really the fun is on the outside, not least the porch where whoever received the commission to carve the capitals (the late Jeremy Williams proposed the Fitzpatrick brothers of Belfast) didn’t hold back. The ornamentation is lavish in the extreme, a bestiary of animal life ranging from bats and monkeys to frogs and rabbits, many of them peeking out of the undergrowth to pull a face as though determined to ruin a staid animal kingdom portrait. It is all rather droll, conveying the impression that the earnest intentions behind Ruskin’s advocacy of the Gothic mode are here being guyed. Fortunately the opportunity to relish this architectural humour remains since Bessmount still stands intact and in good order. The property changed hands in the last century when it once more became a Montgomery house, as is the case to the present. The owners are well aware of the building’s importance and have undertaken repair work where feasible. A cheering note with which to approach the year’s end. If anyone ought to be familiar with the library at Birr Castle, County Offaly it is the building’s present chateleine, Alison Rosse. Located to the immediate right of the entrance hall, this rooom has been the victim of no less than two accidental fires, the first in 1832 and the second ninety years later. But on both occasions the library was restored and its shelves restocked so that today it looks as though the place never suffered any damage. Like all good domestic libraries, it serves a multitude of purposes: not just as a repository for books, but somewhere to take tea or repose, a space in which to seek sanctuary or hospitality. All this is evident in the watercolour seen above which shows the castle library well able to fulfill these functions, and many others besides. It appears in a new publication, Room for Books: Paintings of Irish Libraries featuring twenty-five such spaces as captured by Alison Rosse, accompanied by William Laffan’s text. Most of those included, a mixture of public and private libraries, still exist but one that has since been dispersed is that of the late Maurice Craig, shown below. When Maurice and Agnes Bernelle lived in Sandymount, Dublin he maintained this room on the first floor of their house. 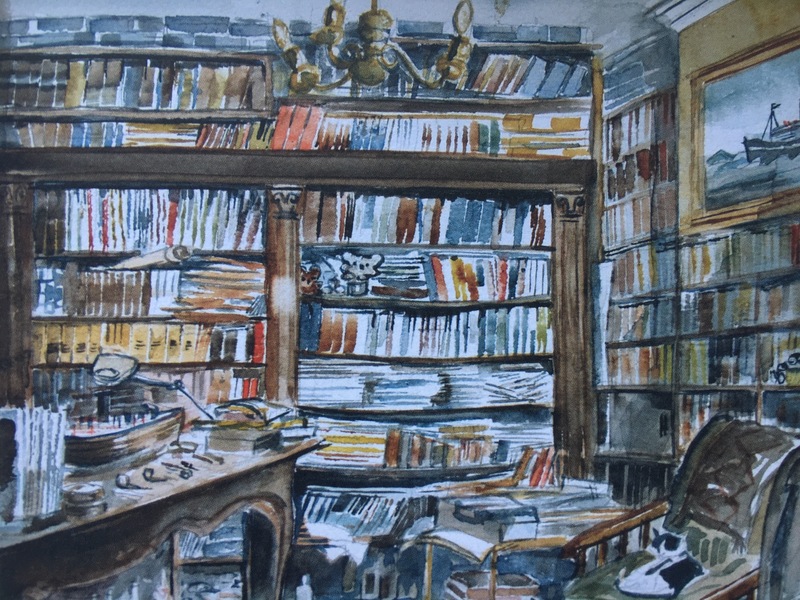 Following her death and his move to a smaller residence, he brought a great many of the books with him: I remember them being crammed into shelves and heaped on every available surface along which a resident cat (Maurice loved cats) would step with such care that no volume was ever displaced. Despite the seeming disorder, he was familiar with the place of every work in the collection and immediately able to lay his hand on whatever was needed for consultation. Bibliophiles love books not just for their physical beauty but also for their content. And such will be the case with the present publication, recommended as a last-minute gift (although book lovers will appreciate receiving a copy any time). The Irish Aesthete wishes a Happy and Peaceful Christmas to all friends and followers. The massive form of Quin Friary, County Clare is due to the fact that when the Franciscan order came here in 1433 it settled inside the ruins of an Anglo-Norman castle. This had been built around 1280 by Thomas de Clare, Lord of Thomond with a square courtyard and cylindrical towers at each corner. However, just six years later the building was attacked by the indigenous Irish who, in the words of a contemporary, left it a ‘hideous blackened cave.’ So it remained until the arrival of the Franciscans who adapted the ruins for their own purpose and remained there for just over a century until the suppression of all such religious houses by Henry VIII. As many readers will be aware, right across Ireland can be seen the remains of hundreds, possibly thousands, of former fine residences dating from the seventeenth century onwards. Even in ruin their scale makes them prominent marks on the landscape, testaments to our country’s history, witnesses to an order which once prevailed but has now passed. Because of the societal and economic imbalance they represented, many of today’s citizens understandably do not mourn their passing. Nevertheless they are part of the national narrative. We ought at least to know their stories, so that they can better inform our own. Unfortunately their mute condition today often means we know little or nothing of each building’s distinctive tale, of how they came into being and then fell into decline. Once this information was familiar, if only to those who occupied the property, or worked on the estate. Now it has frequently been forgotten and another property’s unique character becomes part of the generic ‘Big House’ story. This seems to be the case with Nettleville, County Cork, yet another ruin about which relatively little information is available. Around 1630 John Nettles moved here from Herefordshire around 1630: inevitably he is described in Burke’s Landed Gentry of 1871 as springing from ‘an ancient English family’ (perish the thought that anyone’s background might not disappear into the foggiest mists of time). Evidently he flourished here since in 1666 he was confirmed by Charles II in a grant of land of 1,258 acres in Counties Waterford and Cork, although his residence was in the latter at Tourin, later to pass into the ownership of the Musgrave family. It was his second son, Robert Nettles, who came to live on an estate where the remains of Nettleville can now be found. On the failure of this line of the family, the Cork property passed back to the main branch, and in the second half of the 18th century was inherited by Captain Robert Nettles. Ambrose Leet’s 1814 Directory lists Nettleville as occupied by the Rev Bazil Orpin, who had married one of the Nettles daughters. However, his tenure was only temporary. Although Captain Nettles and his wife had five sons, four of them died young either through accidents or in warfare (one, Ensign William Nettles being killed at the Battle of Waterloo). That left a single heir, Richard Nevill-Nettles who on the death of his father in 1828 inherited Nettleville. He in turn was succeeded by his only son Robert Nettles, listed in the 1870s as owning 1,684 acres in County Cork. Seemingly Nettleville was still occupied by the Nettles family at the start of the last century but thereafter there does not appear to be further mention of them, leading to the supposition that they died out. Interestingly in September 1919 the Irish Builder mentions Cork architect Bartholomew O’Flynn being employed at Nettleville to carry out alterations and additions, so evidently someone was still living there. And so to Nettleville, which in the national register of buildings is listed as being built c.1800, although one suspects this is speculative since what survives of the building makes it difficult to discover any specific design features that would allow more precise dating. The south-facing front of the house, now completely immersed in vegetation, is of two storeys over basement but since the site slopes the rear – which looks down to a point where the river Lee loops around on itself – is of three storeys. On this side, to the east of the house is a single-storey extension with narrow arched niches but there does not seem ever to have been its equivalent to the west. While in the main built of dressed sandstone, the house’s windows feature cut limestone sills and red brick voussoirs; no doubt the whole exterior was originally rendered to give a uniformity of appearance. A short distance to the south-east lies a large yard, the greater part of which is in better condition than the house it was created to serve. Centred on a fine arched gateway, its pediment extended to accommodate a bell, the yard effectively divides into upper and lower sections, assisted once more by the sloping site. Handsomely constructed, and still, at least in part, serviceable, it demonstrates this was once a thriving estate. Now, however, Nettleville is just another ruin on the Irish landscape and its voice in our historical narrative grows weaker as the old buildings grow closer and closer to complete disappearance. A view of the northern end of Sackville (now O’Connell) Street as shown in William Turner de Lond’s depiction of the entry of George IV into Dublin on August 17th 1821. The king had actually landed at Howth five days earlier, on his fifty-ninth birthday and in a state of some inebriation: it may have been as a result of the latter that his ‘official’ arrival only took place when it did. The scene shows George IV, the first British monarch to visit Ireland in 130 years (and the first for much longer to come without bellicose intent), standing in his carriage to acknowledge the cheering crowds. This was not a piece of fiction: a contemporary report in The Patriot observed that ‘they never saw any manifestation of popular enthusiasm so heartfelt, as that which hailed his Majesty from, at least, 100,000 persons of all ranks and estates.’ The painting was only one among several produced to commemorate the occasion (a number of artists recognised its commercial potential) and is of interest for showing the Rotunda Hospital in the background as well as the east side of Rutland (now Parnell) Square. It is one of a number of such works included in a recently-published book, Creating History: Stories of Ireland in Art which accompanies an exhibition of the same name currently running at the National Gallery of Ireland. While at least some of the works discussed are imaginative recreations (such as Samuel Watson’s portrayal of the 11th century Battle of Clontarf, painted in 1844, and James Barry’s Baptism of the King of Cashel by St Patrick, c.1800-1), others provide an invaluable record of how parts of this country looked in the past. Such is the case with the picture shown below, Francis Wheatley’s 1780 picture of the Irish House of Commons. For some observers the interest here would be in identifying some of the political parties included in the work. For others, however, it is especially important for showing how this chamber, designed by Sir Edward Lovett Pearce, looked before being seriously damaged by fire in 1792. Although reconstructed to a simpler design, the House of Commons was abolished eight years later and, as is well-known, when the Parliament building was subsequently bought by the Bank of Ireland, the British government insisted structural changes were made to ensure it could not revert to its original purpose. Creating History: Stories of Ireland in Art examines more than fifty works of art and includes essays by the likes of Professors Tom Dunne and Roy Foster, Róisin Kennedy and Emily Mark-Fitzgerald. Creating History, edited by Brendan Rooney, is published by Irish Academic Press, €24.99. The accompanying exhibition at the National Gallery of Ireland continues until January 15th. These recollections include the proposal that the adjacent mill (which was only demolished in 2005) had been built after the Great Famine. However, Samuel Lewis’ Topographical Dictionary of Ireland (published 1837, that is several years before the onset of famine), notes ‘The Clomanto flour-mills, capable of manufacturing about 12,000 barrels annually, are impelled by a small river that intersects the parish; and attached to them is a large starch-manufactory, both belonging to Mr. W. Lyster.’ It would appear that the ‘barracks’ was owned by Lyster and then passed into the possession of the RIC before eventually being acquired by the Butlers. These recollections show how, although Ireland is a small country, much of its architectural history remains to be studied, ideally before the relevant buildings are forever lost. No smile to bid the gathering shadows die. And the bat hides within its time-worn towers. For victory – basking in its worshipp’d light. Extracted from Lines Written at Jerpoint Abbey by Samuel Carter Hall (1823). In 1788 almost 28,000 silver teaspoons were recorded in the ledger of the Dublin Assay Office, an institution established in 1637 – and still in operation today – to assess the purity of all gold and silver manufactured in Ireland. Teaspoons were especially popular both because their small size made them more affordable than other items in the same metal, but also thanks to the rise in consumption of drinks such as tea, coffee and hot chocolate, all of which were sweetened with sugar. By the late 18th century, for example, the average annual consumption of tea in this country is estimated to have been two or three pounds per person. This fascinating information, and much more beside, can be found in a newly-published study of Silver in Georgian Dublin by Dr Alison FitzGerald. While Irish silver has been well explored by Douglas Bennett and others, the focus of these connoisseur-driven investigations has usually been on matters of style and authorship. FitzGerald on the other hand is representative of a new generation of art historians keen to explore the character of material culture and thus contextualise the object of their attention within its period. This is what she has done so admirably in the present book, which looks at the production, distribution and consumption of silver in Georgian Dublin, and beyond. So, for example, when discussing the increasing popularity of tea over the course of the 18th century, assisted by a gradual reduction in its price, she looks not only at silver tea pots but also the greater use of ceramic vessels, preferable because less expensive. So a household might have a ceramic teapot but also silver sugar tongs (selling for 12 shillings in 1772). The choice of retail premises from which they could make their purchases, while never as great as that in London (where some Irish grandees preferred to shop for such goods) certainly improved over passing decades, and for local clients had the advantage of offering credit for purchases: FitzGerald provides a number of instances where goldsmiths such as Isaac D’Olier had to advertise that all accounts owing to him had to be settled immediately and in full. Then, as now, it was often cheaper to buy at auction, and these events regularly took place, often following a collector’s death: Charles Cobbe, who became Archbishop of Dublin in 1740 acquired a considerable amount of silverware at the sale of his late father-in-law Sir Richard Levinge’s effects. And silver was regularly melted down and refashioned as tastes, and consumer requirements changed. Some items survived better than others, not least teaspoons. The set of ten shown above above, dating from c.1800 and carrying the mark of Carden Terry and Jane Williams, was recently sold by Adam’s of Dublin for €2,500. On the other hand, buckles – once a staple in every gentleman’s wardrobe – gradually disappeared as styles of dress altered. In 1788 more than 24,000 silver buckles were sent to be assayed in Dublin, mostly intended for shoes and knee breeches: by 1800 that number had dropped to a mere eighteen. Once deemed redundant, they faced recycling, and accordingly only a certain number can now be found. The pair shown below, today in the collection of the San Antonio Museum of Art, were made c.1790 by Joseph Jackson of Dublin. Drawing on a huge range of sources ranging from diaries and letters to contemporary guild accounts, inventories and trade ephemera – not to mention the archives of the Dublin Assay Office – Alison FitzGerald’s book is a wonderfully informative, entertaining and engaging read, absolutely packed with information and profusely illustrated with illustrations that complement an already eloquent text. A terrific addition to our knowledge of this period.